When George Brown founded the General Roofing Manufacturing Company in 1904, he could not have imagined the explosive growth this country would experience. The company’s name was changed in 1917 to Certain-Teed from its slogan “Quality made certain, Satisfaction Guaranteed.” CertainTeed continued to grow as the premier asphalt shingle manufacturer. In the 1960’s, the company acquired both a fiberglass insulation business and PVC pipe businesses which led to the introduction of solid vinyl siding. The addition of both Gypsum and Ceilings in 2007 rounded out the scope of building materials currently manufactured by CertainTeed. Through the responsible development of innovative and sustainable building products, CertainTeed has helped shape the building products industry for more than 110 years. Today, CertainTeed® is North America’s leading brand of exterior and interior building products, including roofing, siding, fence, decking, railing, trim, insulation, gypsum and ceilings. A subsidiary of Saint-Gobain, one of the world’s largest and oldest building products companies, CertainTeed and its affiliates have more than 5,700 employees and more than 60 manufacturing facilities throughout the United States and Canada. With more than 300 Roofing options to choose from, and quality standards that lead the industry, you can rest easy knowing CertainTeed has you covered. For homeowners seeking true peace of mind, Landmark® shingles are the high-quality, reliable choice for beautifying and protecting a home. With a dual-layered design that emulates the dimensionality of true wood shake, Landmark asphalt shingles offer the heaviest weight and widest array of color options in their class, allowing you to create or re-create the ideal look for your home with confidence. Backed by a 100+ year legacy of trusted manufacturing performance, all Landmark shingles include CertainTeed’s industry-leading, lifetime-limited warranty. 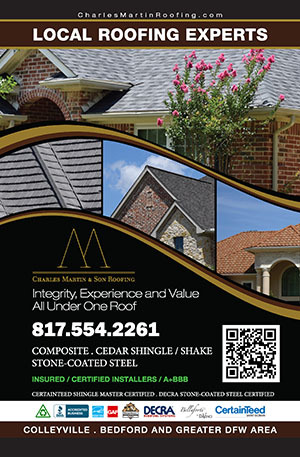 Ask your Charles Martin & Son Roofing representative about installing CertainTeed on your home today! Another beautiful day for roofing! This beautiful roof is Decra shake charcoal with TPO on the flat. We removed the stucco chimneys and replaced with decra shake. Call us today for more info or for a free estimate.